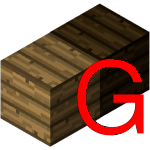 This category contains the nodes that are in the “wood” group. The members of this category are used to make the lowest tier of pickaxes, axes, shovels, swords, hoes and numerous other items. This page was last modified on 27 March 2019, at 16:57.